Sights, smells and sounds? These are some of the factors which enlightened and entertained me to choose Bangkok to have a great tour. Not only the culture, insight, history is making Bangkok as an exciting city in South Asia, the fun in Bangkok city will drive you here definitely. So, here I will tell you the best tours in Bangkok which you must take. Bangkok consists of many temples as you may know. But believe me; the tour to Wat Pho and Wat Trimitr will be the ones which you must-take. Few tours will be jam-packed which is full of sights, facts and history. The trip to great Ayutthaya is a one which will be wonderful. It is Siam’s former capital. This has a plenty of sparks and doesn’t test the staying power of you. River Kwai Tour which includes long-tail boat is a spectacular place which you must visit. Siam Niramit has the world’s largest stage. The initial act is describing how Thailand became a crossroad where civilizations met. The second event is how Karma is binding with the people in Thai and the last is how religious ceremonies earn the merit. There are enchanting places to visit like the Damnoen Saduak which gives a totally perfect experience for you. This is because for the extreme and hospitable tourists environment surrounding this place. There are plenty of canals which are small yet thin and each consists of fresh products. 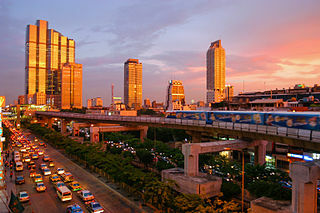 The visually vibrant culture is the thing which makes it a worthwhile place to visit if you are in Bangkok. Another interesting thing about the market is that the pleasant attitude of the sellers will enthrall you and will make you come back to the place again because it is a once in a lifetime experience. Floating market in Bangkok is a place you must visit to get a unique experience. With the touristy atmosphere it has, Damnoen Saduak is regarded as the pioneer of all floating markets which offered an authentic experience for me. Can you imagine a place with wooden row boats floating and places with fresh fruits, flowers and vegetables everywhere when you are moving by the boat? This is the Floating market of China. The food vendors who have filled their vessels with charcoal grills and cauldrons are ready to whip up you a ‘boat-noodle’ bowl which you will request definitely. Chinatown is a very exotic, chaotic and a colorful area which is packed with highest concentration of gold shops in this city also with other market stalls. In the time of big festivals like the Vegetarian festival and the Chinese New Year, celebration spirit is spreading across the city hugely and Chinatown will be the best place if you happen to be in this place during this time. Other than the gigantic reclining statue of Buddha and the Thai massage, Wat Pho has more to be watched by any person. Wat Pho has a collection of fascinating murals, sculptures and murals which represents various subjects like warfare, archaeology and astronomy. This vast temple complex consists of landscaped garden which has stone sculptures, a souvenir shop, the stupas made out of glazed porcelain and College of Traditional medicine. Bangkok restaurants provide you a variety of price ranges and they are open 24 hours a day. The city of Bangkok is like heaven for the food lovers which have a culinary journey which is sensational and a great taste experience is awaiting you guaranteeing to delight your taste buds. Other than the famous Thai cuisine with its spicy, salty and sweet blend, it also has a wide variety of options from, other famous cuisine types in the world. Bangkok is a city which is rich with contrasts, juxtapositions as well as contradictions. This can be considered as a breeding ground with a fertility which consists of strangely beautiful places which makes you stop and reach for your camera to take a shot. Here I will tell you about those kind of places which are unusual sights that you must visit. Phallic shrine is one such place. At the Goddess Tubtim shrine, there are hundreds of phalluses which are oversized and they can be called as erect proof that tells you even the spirit world is also really matters. This place was found in grounds of Swissotel Nai Lert hotel where people are flocking here to find for fertility. The first and last place you must definitely visit is the Samut Prakan’s Erwan Museum which is a large place with a three headed elephant statue. It is a splendid and towering beast which has a weight of 250 tons. It has a height of 29 meters and a length of 39 meters. Forensic Museum is also an unusual place which you must visit in Bangkok. It contains of corpses of mass murdering cannibals and glass jars which contain deformed babies and also autopsy photographs which are preserved for posterity. Remember! This place is not for the faint-hearted. Wat Pariwat which is nicknamed as the David Beckham Temple has an unusual reason for this name. In this huge altar, it has an anonymous looking temple, a Garuda in its back corner, one of the mythic winged creatures, was been replaced by David Beckham! This statuette is of a height of 30 cm only and the haircut in the carving is not the one we usually know. The human body museum is also a great place which you must visit. This is located in Siam square. It has an amazing exhibition of fourteen dissected human bodies from Japan. Some people may think this is really a creepy place or little disturbing. But this can be called as an educational exhibit as this is located in the faculty of dentistry building in the Chulalongkorn University. My name is James Frank, a 33 year old professional webmaster who is currently handling a few clients based in the UK. I have been living in Thailand for the past 3 years. In particular, I have been resident in the city of Bangkok and I have a lot to share about my experiences and encounters in this city. Although I am originally from the city of Manchester, my stay in this part of the world has taught me a number of things that I so desire to share with the rest of the world. First of all, I would like to air my views on the local restaurants here. Frankly speaking, this place is home to some of the world’s best eating places. No doubt, the restaurants here compete favorably with most of the internationally recognized restaurants across the globe. I once visited the Issaya Siamese club, where I found a very fine restaurant. It is quite charming and fairly romantic due to its arrangement. The restaurant has been around for the past 100 years.it is renowned for its exceptional hospitality and mouth-watering meals. No doubt, its existence for the past 100 years is actually owed to fineness and professionalism. If you want to enjoy some of the best tourist sites in the city, you can take advantage of the Old city which is also referred to as Wat Pho. It is a pleasant place to visit due to its rich cultural heritage. There is also the Chao Phraya River and waterways which is located in the Riverside area. Eating places also exist in the city. I personally enjoyed my visit to the Elements and Nahm, in Chidlom and Sathorn respectively. This is where I enjoyed some of the most mouth-watering meals that I have ever come across since I started living in Thailand.